Beta Zeolite is the only one structured with three-dimensional 12-membered ring channels among zeolite family. Beta Zeolite is the only one structured with three-dimensional 12-membered ring channels among zeolite family. It is of high activity in hydrocracking and hydroisomerization catalyzing. It is capable of linear paraffin adsorption and anti-poison with sulfur and nitrogen. It is used in petrochemical industrial for preparation of cumin by benzene and propylene alkylation, diisopropylbenzene by cumin disproportionation, methylbenzene isopropylation, arene alkylation, diisopropylbenzene transalkylation, propylene etherification, carbinol aromatization, propylene epoxide and alcohol etherification, phenol methylation, aminobenzene methylation, cumin and methylbenzene transalkylation, methylbenzene disproportionate, ect.. The application of Beta Zeolite and USY Zeolite brings octane number increase. 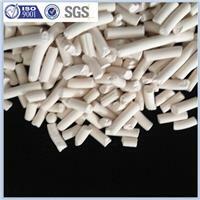 In fine chemical industrial, Beta Zeolite is good with activity and selectivity in dewatering and deminizating.